Pápai Páriz Ferenc, Album amicorum p. 216. Godefridus Jüngst SS. Theol. in Eccl[esia] et Ill[ustri] Sch[ola] ibid. Doct. et pr. p.
Gottfried Jüngst was born in Herborn on October 19, 1665, a son of Johann Ludwig J. town assessor. He learned in Herborn, then he attended theology under Matthias Nethenus (1618-1686) and Johannes Melchior (1646-1689). Due to their influence Jüngst became an important representative of Cocceian thought. In 1686 he disputed under the chairmanship of Nethenus, and in 1687 he became pastor in Ballersbach (Dillenburg district). In 1690 he was assistant pastor in Herborn. In 1688 he married Margarete Christine, daughter of the pastor of Ballersbach Johann Jakob Rückert. In 1692 he was invited professor of theology to the academy of Hanau, and in 1701 he became supervisor of the diocese of Hanau. In 1697 he obtained doctorate of theology in Marburg. From 1706 he was pastor of St. Ansgar in Bremen, and from 1707 until his death professor of the academy. He was an outstanding homiletician, and an eminent representative of both practical and theoretical theology. He published sermons and academic disputes. Our Library conserves the dissertation Christus Sacerdos altior coelis factus by Wilhelm Heinrich Manger (Bremen, 1710), defended under the chairmanship of Gottfried Jüngst. He died in Bremen, on August 25, 1726. 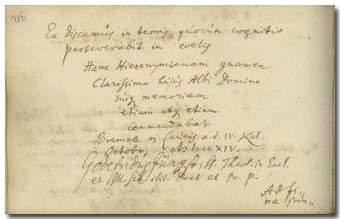 Gottfried Jüngst, pastor of the St. Ansgar in Bremen wrote in the album on September 28, 1714 on the page facing the note of his colleague Ludwig Georg Treviranus, pastor of Bremen-Neustadt (p. 217). His brief sentence written through the two pages – Ad fines pagina jungit – probably refers to their friendly relationship. The dating includes a reference to the name of Cauci – the German tribe that had lived in this region – similarly to the note of Theodor von Hase (p. 225).